Serena and Dan certainly seem smitten, and it's easy to see why. They're great together! 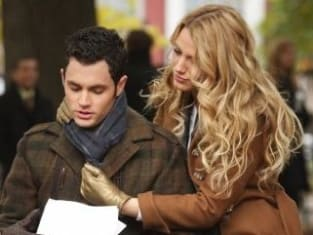 Gossip Girl Season 1 Episode 13: "A Thin Line Between Chuck and Nate"
Gossip Girl: Will Dan and Serena Reunite in Season Four? Eleanor: Are you all right? Eleanor: Well, Serena has. What's wrong? Blair: I don't know. I can't be held responsible for her mood swings. Eleanor: Were you arguing about the possibility that your condition may have returned. Eleanor: I heard you the other day in your bathroom with the water running. Blair: I'm very stressed. And with you and Serena down my throat I can hardly see straight, never mind keep food down. I'm not pregnant. I command myself to not be pregnant. Permalink: I'm not pregnant. I command myself to not be pregnant. Gossip Girl Round Table: "A Thin Line Between Chuck and Nate"